“Pinkville” has become a widely known code word among the military in a case that many officers and some Congressmen believe “will become fat mote controversial than the recent murder charges against eight Green Berets. Army investigation teams spent nearly one year studying the incident before filing charges against Calley, a platoon leader of the Eleventh Brigade of the American Division at the time of the killings. Calley was formally charged on or about Sept. 6, 1969, in the multiple deaths, just a few days before he was due to be released from active service. Calley has since hired a prominent civilian attorney, former Judge George W. Latimer of the U.S. Court of Military Appeals, and is now awaiting a military determination of whether the evidence justifies a general court-martial Pentagon officials describe the present stage of the case as the equivalent of a civilian grand jury proceding. Calley, meanwhile, is being detained at Fort Benning, where his movements are sharply restricted. Even his exact location on the base is secret; neither the provost marshal, nor the Army’s Criminal Investigation Division knows where he is being held. The Army has refused to comment on the case, “in order not to prejudice the continuing investigation and rights of the accused.” Similarly, Calley—although agreeing to an interview—refused to discuss in detail what happened on March 16,1968. However, many other officers and civilian officials, some angered by Calley’s action and others angry that charges of murder were filed in the case, talked freely in interviews at Fort Benning and Washington. The Pinkville area, about six miles northeast of Quang Ngai, had been a Viet Cong fortress since the Vietnam war began. In early February 1968, a company of the Eleventh Brigade, as part of Task Force Barker, pushed through the area and was severely shot up. Calley’s platoon suffered casualties. After the Communist Tet offensive in February 1968, a larger assault was mounted, again with high casualties and little success. A third attack was quickly mounted and it was successful. “Every time we got hit it was from the rear,” he said. “So the third time in there the order came down to go in and make sure no one was behind. “We were told to just clear the area. It was a typical combat assault formation. We came in hot, with a cover of artillery in front of us, came down the line and destroyed the village. “You can’t afford to guess whether a civilian is a Viet Cong or not. Either they shoot you or you shoot them. “This case is going to be important—to what standard do you hold a combat officer in carrying out a mission? Adding to the complexity of the case is the fact that investigators from the Army inspector general’s office, which con- ducted the bulk of the investigation, considered filing charges against at least six other men involved in the action March 16. A Fort Benning infantry officer has found that the facts of the case justify Calley’s trial by general court-martial on charges of premeditated murder. Pentagon officials said that the next steps are for the case to go to Calley’s brigade commander and finally to the Fort Benning post commander for findings on whether there should be a court-martial. If they so hold, final charges and specifications will be drawn up and made public at that time, the officials said. Calley’s friends in the officer corps at Fort Benning, many of them West Point graduates, are indignant. However, knowing the high stakes of the case, they express their outrage in private. “They’re using this as a Goddamned example,” one officer complained. “He’s a good soldier. He followed orders. There is another side of the Calley case—one that the Army cannot yet disclose. Interviews have brought out the fact that the investigation into the Pinkville affair was initiated six months after the incident, only after some of the men who served under Calley complained. The Army has photographs purported to be of the incident, although these have not been introduced as evidence in the case, and may not be. Asked about this, Calley refused to comment. None of the men interviewed about the incident denied that women and children were shot. A source of amazement among all those interviewed was that the story had yet to reach the press. “Pinkville has been a word among GIs for a year,” one official said. “I’ll never cease to be amazed that it hasn’t been written about before.” A high-ranking officer commented that he first heard talk of the Pinkville incident soon after it happened; the officer was on duty in Saigon at the time. Why did the Army choose to prosecute this case? On what is it basing the charge that Calley acted with premeditation before killing? The court-martial should supply the answers to these questions, but some of the men already have their opinions. Another view that many held was that the top level of the military was concerned about possible war crime tribunals after the Vietnam war. As for Calley—he is smoking four packs of cigarettes daily and getting out of shape. He is 5-foot-3, slender, with expressionless gray eyes and thinning brown hair. He seems slightly bewildered and hurt by the charges against him. He says he wants nothing more than to be cleared and return to the Army. Calley had been shipped home early from Vietnam, after the Army refused his request to extend his tour of duty. Until the incident at Pinkville, he had received nothing but high ratings from his superior officers. He was scheduled to be awarded the Bronze and Silver Stars for his combat efforts, he said. He has heard nothing about the medals since arriving at Fort Benning. Calley was born in Miami, Fla., and flunked Out of the Palm Beach Junior College before enlisting in the Army. He became a second lieutenant in September 1967, shortly after going to Vietnam. The Army lists his home of record as Waynesville, N.C.
WASHINGTON, Nov. 20—Three American soldiers who participated in the March 1968 attack on a Vietnam village called Pinkville said in interviews made public today that their Army combat unit perpetrated, in the words of one, “pointblank murder” on the residents. “The whole thing was so deliberate. It was point-blank murder and I was standing there watching it,” said Sgt. Michael Bernhardt, Franklin Square, N.Y., now completing his Army tour at Fort Dix, N .J . Bernhardt was a member of one of three platoons of an Eleventh Infantry Brigade company under the command of Capt. Ernest Medina. The company entered the Viet Cong-dominated area on March 16, 1968, when on a search-and-destroy mission. Pinkville, known to Vietnamese as Song My village, is about six miles northeast of Quang Ngai. The Army has charged Lt. William L. Calley Jr., Miami, one of Medina’s platoon leaders, with the murder of 109 South Vietnamese civilians in the attack. A squad leader in Calley’s platoon, Sgt. David Mitchell, St. Francisville, La., is underinvestigation for assault with intent to murder. At least four other men, including Medina, are under investigation in connection with the incident. 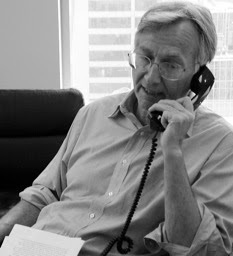 Calley and his attorney, George W. Latimer, Salt Lake City, have said that the unit was under orders to clear the area. “They (Calley’s men) were doing a whole lot of shooting up there, but none of it was incoming—I’d been around enough to tell that. I figured they were advancing on the village with fire power. “As I walked in, you could see piles of people all through the village. ... all over. They were gathered up into large groups. “I saw them shoot an M-79 (grenade launcher) into a group of people who were still alive. But it (the shooting) was mostly done with a machine gun. They were shooting women and children just like anybody else. An Army communique reporting on the operation said that Medina’s company recovered two M-I rifles, a carbine\ a short-wave radio and enemy documents in the assault. 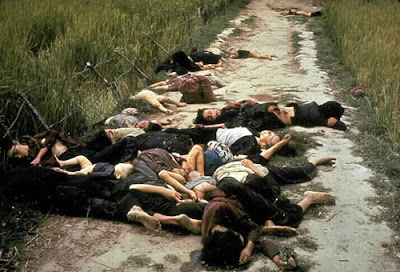 The Viet Cong body count was listed as 128 and there was no mention of civilian casualties. Bernhardt said he had no idea precisely how many villagers were shot. He said that he had heard death counts ranging from 170 to more than 700. Bernhardt also said he had no idea whether Calley personally shot 109 civilians, as the Army has charged. However, he said, “I know myself that he killed a whole lot of people.” Residents of the Pinkville areas have told newspapermen that 567 villagers were killed in the operation. Why did the men run amuck? A few days before the mission, he said, the men’s general contempt for Vietnamese civilians intensified when some GIs walked into a landmine, injuring nearly 20 and killing at least one member of the company. Why didn’t he report the incident at the time? Bernhardt said that about 90 per cent of the 60 to 70 men in the short-handed company were involved in the shootings. He took no part, he said. “I only shoot at people who shoot at me,” was his explanation. “The Army ordered me not to talk,” Bernhardt told the interviewer. “But there are some orders that I have to personally decide whether to obey; I have my own conscience to consider. His opinion, he said, is that a higher Tanking officer must have ordered the destruction of Pinkville. “Calley’s just a small fry,” he said. Bernhardt said the Army must have known at high levels just what did happen at Pinkville. “They’ve got pictures. Some dude went along on the mission and shot pictures,” he said. Bernhardt said the photographs were shown to him in the Article 32 proceeding, which concluded that the chargesagainst Calley were justified. “They showed a mass of people. …this pile-up of people. I don’t see how anybody could say it was artillery or crossfire that killed those people,” he said. 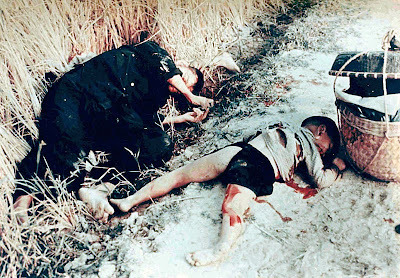 (The Cleveland Plain Dealer printed today photographs showing South Vietnamese civilians allegedly killed in the incident. It said the photographs came from a former Army combat photographer, Ronald L. Haeberle, Cleveland. Another witness to the shootings was Michael Terry, Orem, Utah, then a member of the C Platoon of Medina’s company and now a sophomore at nearby Brigham Young University. Interviewed at his home, Terry said he, too, came on the scene moments after the killings began. At one point, he said, more than 20 villagers were lined up in front of a ditch and shot. “They had them in a group standing over a ditch-just like a Nazi-type thing. ...One officer ordered a kid to machine-gun everybody down, but the kid just couldn’t do it. He threw the machine gun down and the officer picked it up. ...” Terry said. Apparently one officer, who was not from Medina’s company, attempted to halt the shootings. Terry and Bernhardt both reported that a helicopter pilot from an aviation support unit landed in the midst of the incident and attempted to quell it. The officer warned that he would report the shootings. On the next day, the pilot was killed in action and the subsequent investigation started by officials at the Eleventh Brigade was dropped after one and a half days because of insufficient evidence. Terry said he first learned of the present investigation when he was interviewed last spring by a colonel from the Army Inspector General’s office. Bernhardt was not questioned until a team from the Army’s Criminal Investigation Division visited him two months ago. The third witness to the Pinkville shootings cannot be identified. He is still on active duty with the Army on the West Coast. But he corroborated in detail the Bernhardt and Terry descriptions of that day in March 1968. “I was shooting pigs and a chicken while the others were shooting people,” he said. “It isn’t just a nightmare; I’m completely aware of how real this was. All three GIs were read key excerpts from a three-page letter sent in March by a former GI, Ronald Ridenhour, to the Army and 30 other officials, including some Senators. The letter out- lined the Pinkville incident as he understood it. It was Ridenhour’s persistence that prompted the Army to begin its high-level investigation in April. Ridenhour, now a student at Claremont ( Calif.) Men’s College, was not in Medina’s company and did not participate in the shootings. He relied on information from Terry and Bernhardt, among many others, to draft his letter. The source said also that he understood that Calley and other officers in the company initially resisted the orders but eventually did their job. Calley’s platoon led the attack on the village, with the other units forming a horseshoe-shaped cordon around the area, to prevent enemy troops from fleeing. “I don’t care whether Calley used the best judgment or not—he was faced with a tough decision,” the source said. TERRE HAUTE, Ind., Nov. 25—A former GI told in interviews yesterday how he executed, under orders, dozens of South Vietnamese civilians during the United States Army attack on the village of Song My in March 1968. He estimated that he and his fellow soldiers Shot 370 villagers during the operation in what has become known as Pinkville. Paul Meadlo, 22 years old, West Terre Haute, Ind., a farm community near the Illinois border, gave an eyewitness account—the first made available thus far—of what happened when a platoon led by Lt. William L. Calley Jr. entered Pinkville on a search-and-destroy mission. 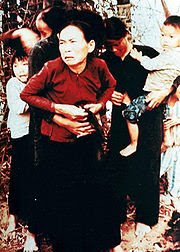 The Army has acknowledged that at least 100 civilians were killed by the men; Vietnamese survivors had told reporters that the death total was 567. Meadlo, Who was wounded in a mine accident the day after Pinkville, disclosed that the company captain, Ernest Medina, was in the area at the time of the shootings and made no attempt to stop them. Calley, 26, Waynesville, N .C., has been accused of the pre- meditated murder of 109 civilians in the incident. Medina, as commander of the Eleventh Infantry Brigade unit, is under investigation for his role in the shootings. Last week the Army said that at least 24 other men were under investigation, including Calley’s chief noncommissioned officer, Sgt. David Mitchell, 29, St. Francisville, La., who is being investigated for assault with intent to commit murder. Calley was ordered yesterday to stand general court-martial. “There was supposed to have been some Viet Cong in Pinkville and we began to make a sweep through it. Once we got there we began gathering up the people...started putting them in big mobs. There must have been about 40 or 45 civilians standing in one big circle in the middle of the village ... Calley told me and a couple of other guys to watch them. “So we stood about 10 or 15 feet away from them, then he (Calley) started shooting them. Then he told me to start shooting them. ... I started to shoot them, but the other guys (who had been assigned to guard the civilians) wouldn’t do it. “So we (Meadlo and Cilley) went ahead and killed them. I used more than a whole clip—actually I used four or five clips,” Meadlo said. (There are 17 M-16 shells in a clip.) He estimated that he killed at least 15 civilians-or nearly half of those in the circle. The company had been in the field for 40 days without relief before the Pinkville incident on March 16, and had lost a number of men in mine accidents. 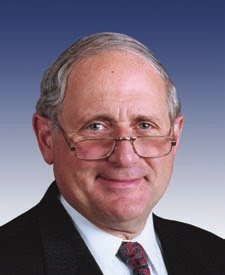 Hostility to the Vietnamese was high in the company, Meadlo said. “We had about seven or eight civilians gathered in a hootch, and I was going to throw a hand grenade in. But someone told us to take them to the ditch (a drainage ditch in the village into which many civilians were herded-and shot). His role in the killings had not yet ended. Meadlo is a tall, clean-cut son of an Indiana coal mine worker. He married his high-school sweetheart in suburban Terre Haute, began rearing a family (he has two children) and was drafted. He had been in Vietnam four months at the time of Pinkville. On the next day, March 17, his foot was blown off, when, while following Cilley on an operation, a land mine was set off. As Meadlo was waiting to be evacuated, other men in the company had reported that he told Calley that “this was his (Meadlo’s) punishment for what he had done the day before.” He warned, according to onlookers, that Calley would have his day of judgment too. Asked about this, Meadlo said he could not remember. Meadlo is back at a factory job now in Terre Haute, fighting to keep a full disability payment from the Veterans’ Administration The loss of his right foot seems to bother him less than the loss of his self-respect. Like other members of his company, he had been called just days before the interview by an officer at Fort Benning, Ga., where Calley is being held, and advised that he should not discuss the case with reporters But, like other members of his company, he seemed eager to talk. “This has made him awful nervous,” explained his mother, Mrs. Myrtle Meadlo, 57, New Goshen, Ind. “He seems like he just can’t get over it. He began having serious doubts that night about what he had done at Pinkville. He says he still has them. “The kids and the women—they didn’t have any right to die. “In the beginning,” Meadlo said, “I just “thought we were going to be murdering the Viet Cong.” He, like other members of his company, had attended a squad meeting the night before, at which time Company Commander Medina promised the boys a good firefight. Calley and his platoon were assigned the key role of entering the Pinkvi1le area first. “When we came in we thought we were getting fired on,” Meadlo said, although the company suffered no casualties, apparently because the Viet Cong had fled from the area during the night. “We came in from this open field, and somebody spotted this one gook out there. He was down in a shelter, scared and huddling. Someone said, ‘There’s a gook over here,’ and asked what to do with him. Mitchell said, ‘Shoot him,’ and he did. The gook was standing up and shaking and waving his arms when he got it. Meadlo said he crashed through the door and “found an old man in there shaking. Women and children also were shot. Meadlo estimated that at least 310 persons were shot to death by the Americans that day. Two things puzzled him. He vigorously disputes the repeated reports of an artillery barrage before the village was approached. “There wasn’t any artillery barrage whatsoever in the village. Only some gunships firing from above,” he said. The South Vietnamese government said Saturday that 20 civilians were killed in the Pinkville attack, most of them victims of tactical air strikes or an artillery barrage laid down before the U.S. troops moved in. The government denied reports of a massacre. Meadlo is curious also about the role of Capt. Medina in the incident. The whole operation took about 30 minutes, Meadlo said. As for Calley, Meadlo told of an incident a few weeks before Pinkville. Meadlo is not sure, but he thinks the feel of death came quickly to the company once it got to Vietnam. [Texts reproduced from Reporting Vietnam, Part Two: American Journalism 1969-1975 (Library of America, 1998), pp. 13-27.